Would you love to have better sleep every night? Want to know the world's best massage techniques? Do you wish you had vibrant health? 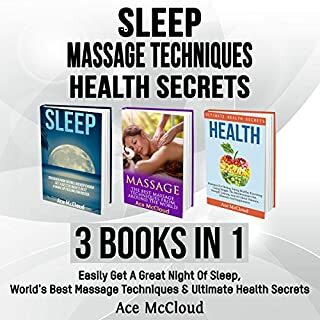 Whether you want to start feeling great with better sleeping habits, determine the massage therapy that best suits your needs, or get vibrant health, this audiobook will teach you everything you need to know. Great ways for sleeping better and being healthy! This is a very helpful audio book filled with great information from beginning to end. I like that it has very little fluff and is mostly solid facts and great information. The sleep section was my favorite and gave me lots of great ways to improve my sleep which are working well. Turning down the temperature along with some chamomile tea an hour before sleep helped me, along with some lavender essential oil before bed along with the recommended health supplements. The massage techniques section was very helpful as well, it gave me some good tips to use when massaging my girlfriend as well as helping me decide which massage therapist I should go see. The shiatsu technique where they walk on your back was really great and never would of thought of it on my own. The health secrets section is comprehensive and filled with ways to be strong and healthy. Highly recommended to anyone who wants to sleep better and live healthier! Would you love to feel loose and carefree throughout the day? Do you wish you had vibrant health? Want to know the world's best success habits? 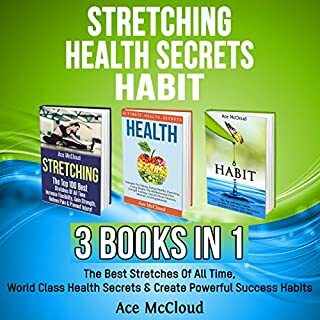 Whether you want to learn professional stretching routines, increase your energy and physical health, or eliminate bad habits and easily establish new good ones, this audiobook will teach you everything you need to know. Great ways to be healthier the smart way! This is a very helpful audio book filled with great information from beginning to end. I like that it has very little fluff and is mostly solid facts and great information. I wish I would of listened to this years ago as I discovered a lot of great knowledge that I am actively using now. Starting a stretching routing has helped me tremendously. The audio explains in detail how to do all the stretches and it has made a major difference in my life. I have healed my lower back problems and I feel great each morning after my stretching routine. The health secrets section is comprehensive, covering everything from diet, to exercise, to supplements and everything in between. The habit section has helped me tremendously as well. It's amazing how great you can perform when you are creating the right habits and doing them daily. I would recommend this audio to anyone who wants to live a better life! Would you love to feel loose and carefree throughout the day? Do you wish you had vibrant health? Want to sleep better? 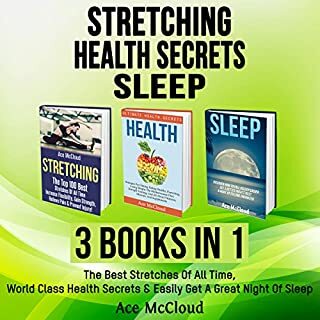 Whether you want to learn professional stretching routines, increase your energy and physical health, or start feeling great with better sleeping habits, this audiobook will teach you everything you need to know. Wonderful information for living a better life! This audio is jam packed with great information from beginning to end with very little fluff. I wish I would of listened to this years ago as I discovered a lot of great knowledge that I am actively using now. Starting a stretching routing has helped me tremendously. The audio explains in detail how to do all the stretches and it has made a major difference in my life. I have healed my lower back problems and I feel great each morning after my stretching routine. The health secrets section is comprehensive, covering everything from diet, to exercise, to supplements and everything in between. The sleep section has helped me tremendously as well. It's amazing how great you feel when you are getting the proper amount of deep sleep that you need. No more waking up exhausted! I would recommend this audio to anyone who wants to live a better life! Want to swim better? Would you like to wake up each day feeling excited and motivated? Ready to get the edge on the competition? 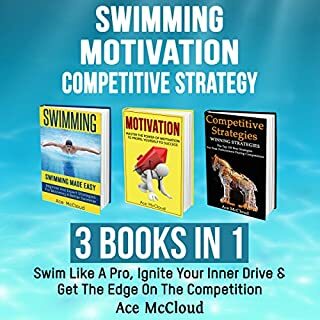 Three audiobooks in one: An unbeatable combination of the best ways to dominant in the pool, stay motivated, and compete at a higher level. Great ways to swim better! This is a very helpful audio book filled with great information from beginning to end. I like that it has very little fluff and is mostly solid facts and great information. The swimming section had detailed knowledge of all the major strokes and how they should be done, along with tips for how to position the arms, legs, hands and other body parts for peak performance in the water. It also had some great training routines specifically designed for swimmers. The motivation section was great as well. I didn't realize you had to feed your motivation daily or it will diminish. Also had a lot of great tips for getting and staying motivated. The competitive strategy section was good as well. You can apply it to swimming as well as your daily life. Great ways to be prepared when it comes time to perform, Highly recommended! Create a team of leaders. Shape your team members into peak performers. Form a cooperative, healthy, and powerful team of individuals who are pulling together towards a common goal - to win in the most dominant ways possible! Profit from more than 100 powerful tactics, ideas, and strategies for successful marketing. Discover how big companies successfully brand and market their products, and then apply their strategies to your own business. Great ways to build great teams and boost sales! 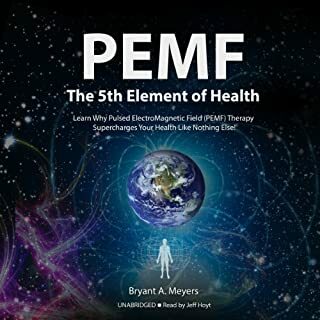 This is a very helpful audio book filled with great information from beginning to end. I like that it has very little fluff and is mostly solid facts and great information.The team building section was very enlightening. I know first hand how even one bad team member can bring down morale and performance of the whole team. I really love the recruiting advice as well as the many different ways to build up morale and get people working together for a cause. The marketing section was excellent as well, especially when used in conjunction with the sales section. 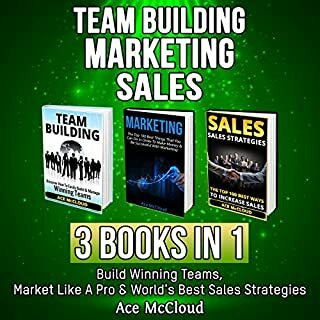 Anyone in business should be able to get a bunch of great strategies to put together for better marketing and then closing more sales.I wish I would of listened to this a year ago. Highly recommended! Do you ever wonder what you are truly capable of accomplishing? Do you wish you could find an easy way to make good habits permanent? Want to know the world's best success strategies? 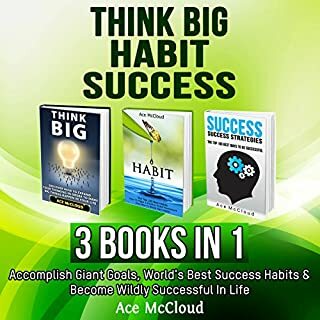 Three audiobooks in one: An incredible combination of ways to think big, the top 100 best habits of all time, and how to become wildly successful in life. Great strategies for thinking big and success! This is a very helpful audio book filled with great information from beginning to end. I like that it has very little fluff and is mostly solid facts and great information. The think big section was my favorite and it shows a variety of ways to change your thinking to make drastic improvements in your goals and your life. The habit section was especially helpful and gave me some great ways for making new good habits and eliminating old bad habits The success section was filled with great information for overall success in life. Lots of great ways to order your day so that you are getting the most important things done and eliminating the things from your life that are not helpful. This is a great audio for anyone who would like a better life. Highly recommended! Do you ever wonder what you are truly capable of accomplishing? Are you tired of living a mediocre and uninspired life? Want to know the world's best success strategies? 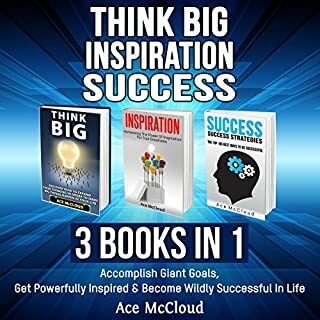 Whether you want to create big things in your life, learn how to live a truly inspired life, or start using world class success habits, this audiobook will teach you everything you need to know. Great ways to see big improvements in life! This is a very helpful audio book filled with great information from beginning to end. I like that it has very little fluff and is mostly solid facts and great information. The think big section was my favorite and it shows a variety of ways to change your thinking to make drastic improvements in your goals and your life. The inspiration section was especially helpful and gave me some great ways for enhancing my mood and getting myself inspired to accomplish my goals. The success section was filled with great information for overall success in life. Lots of great ways to order your day so that you are getting the most important things done and eliminating the things from your life that are not helpful. This is a great audio for anyone who would like a better life. Highly recommended! Do you ever wonder what you are truly capable of accomplishing? Do you long for greater control of your life? Do you wish you could find an easy way to make good habits permanent? 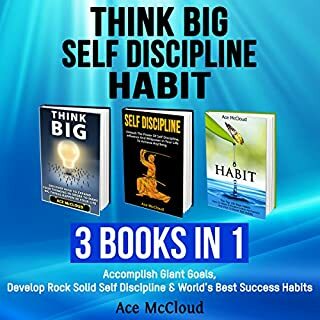 Three audiobooks in one: An incredible combination of ways to think big, strategies to increase your self-discipline, and the top 100 best habits of all time! This is a very helpful audio book filled with great information from beginning to end. I like that it has very little fluff and is mostly solid facts and great information. The think big section was my favorite and it shows a variety of ways to change your thinking to make drastic improvements in your goals and your life. The self discipline section was especially helpful and gave me some great techniques for enhancing my good behaviors and ways to avoid negative behaviors. The habit section was my favorite. 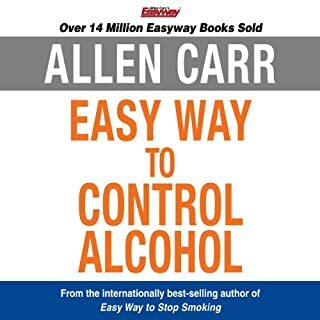 It gives a comprehensive list of incredible habits that can make you rlife better as well as ways to eliminate bad habits and make good habits permanent. This is a great audio for anyone who would like a better life. Highly recommended!